If you want to run a simulated Windows Mobile device, installing the Windows Mobile 5.0 SDK can be a challenge. For starters, the SDK is about 175MB, then there’s the fact that it only works with Visual Studio 2005. If you’re developing software, you’ll obviously need to go the SDK route, but if you just want to try some applications, play with the UI, or check how your site looks in a small screen browser, the Windows Mobile Device Emulator is a great alternative. It’s under 60MB and is standalone, not requiring Visual Studio at all. The Windows Mobile Team Blog has some handy shortcut key references (and, it’s where I learned about the emulator). 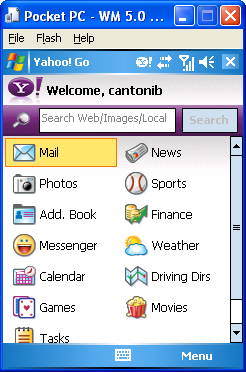 Screenshots below show the Pocket PC emulator running with IE viewing my Mobile Websites page on the left and Yahoo! Go running on the right.